TGI-Friday!!! My kids are heading into their spring break week, so that means some quality R&R time with my family! Can't wait. 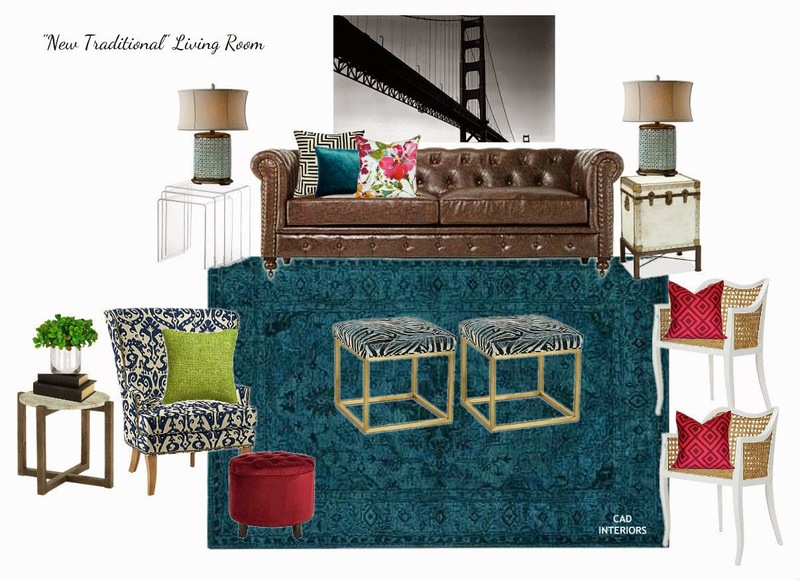 I have a new mood board for you today that was inspired by the traditional chesterfield sofa. I don't typically gravitate towards super traditional furnishings, but I do love the classic chesterfield. It is such a timeless piece and makes me feel grown up! When designing around very traditional pieces, like the chesterfield sofa, I always balance the design by introducing something modern and/or unexpected in the space. Incorporating non-traditional elements helps make a more traditional space feel fresh, current, and young! 1. Think outside the box for a coffee table. In this design, I paired two ottoman stools to create a coffee table. It is unexpected and flexible. 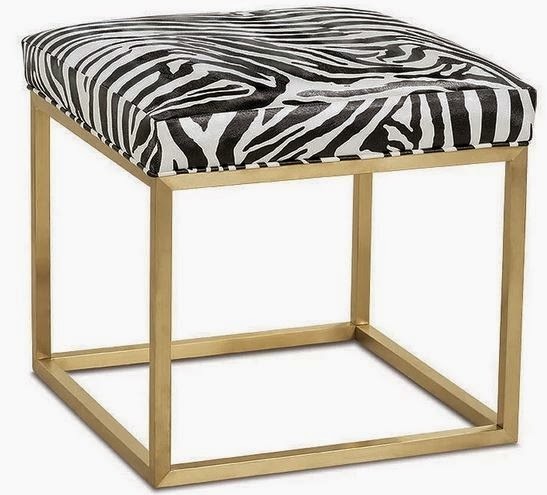 The fact that they are upholstered in a whimsical animal print also injects a big dose of the unexpected! 2. Re-invent traditional pieces with modern upholstery. The wingback accent chair has traditional lines, but when upholstered in a modern ikat fabric, it gets a fresh updated look. 3. Select a contrasting style for an accent piece(s). The acrylic nesting end tables scream modern. If you are willing to spend a bit more, you can opt for lucite tables! Selecting an accent piece like this is unexpected, especially when juxtaposed against the traditional chesterfield. I particularly love using these acrylic tables in this design because it is visually less imposing and balances the "heaviness" of the sofa. 4. Use black and white photography as art. This is an effective way to bring in a contemporary/modern look. The contrast in styles is bold and unexpected, yet typically blends well together. 5. Bring on the fun colors. In this design, I used pillows to bring in pops of bold color. Unlike the furnishings, I went bold with the accessories as a deliberate way to bring fresh contrast to the neutral foundation of the room. I love the combination of teal, fuschia, and green, so naturally, this room got a dose of those colors! These colors are also playful and on trend. The saturated blue hue of the area rug also gives it a more "new traditional" feel. Interested in a room design? Please feel free to contact me for a quote. I am currently accepting new clients starting mid/late April.